Click here to see a first year physics courses road map to enter any of the Physics & Astronomy specializations in second year. Download the PDF version of this graph. 1. If PHYS 101 is taken in Winter Term 2, PHYS 118 can be deferred to Summer Term 2. PHYS 119 can be taken along with PHYS 101 in Winter Term 2 or in Summer Session. 2. Students with 85% or higher in PHYS 101 or PHYS 117 may take PHYS 108. Students from PHYS 107 may take PHYS 118 in place of PHYS 108. 3. Strong students (with 85% or higher in both PHYS 100 and MATH 100 or equivalent) should consult the First Year Physics Advisor about other possibilities. 4. 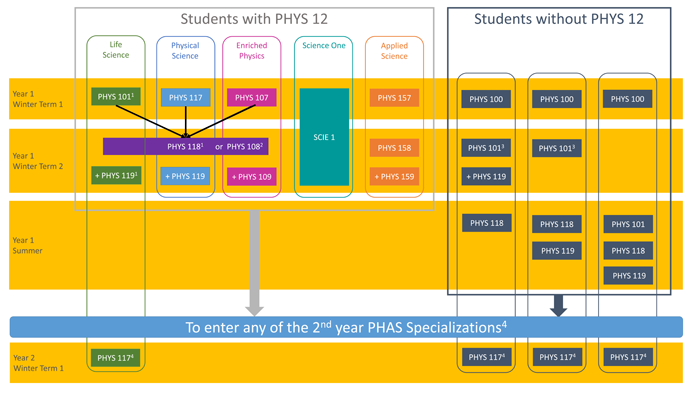 Students may be admitted into one of the PHAS specializations they are eligible for before having PHYS 117 completed, but will be required to take PHYS 117 before they proceed to PHYS 216. Please note for students starting a science degree program at UBC in 2019 there will be new breadth requirements for graduation. Read details here.